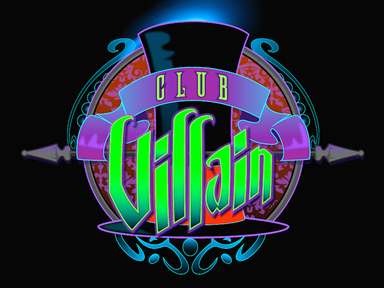 The Club Villain at Disney's Hollywood Studios is a limited run club that features villain-themed food, beverage, performances, a DJ (with ample dance floor space available), and four face-charater villains (complete with detailed photo areas) that you can interact and take pictures with! Maleficent, the Queen of Hearts, the Evil Queen (Snow White) and Cruella De Vil (and possibly Dr. Facilier as he tends to work the room from time to time) are all on hand to mix and mingle with at the event. The food theme is "New Orleans" and features delicacies like tender beef striploin rubbed with herbes de Provence, Voodoo sticky “pig wings” with citrus gremolata and spicy shrimp sautéed with Andouille sausage, tomato, okra and onions over creamy polenta. Adult beverages are on hand as well, including a couple of evil-themed mixed cocktails, wine, beer and soda. There are also quite a few "small bites" type of desserts to close out your meal. All food and beverage is "all you care to enjoy"
Seating is "banquet style" which basically means most of the tables seat four and seating is prearranged. Large groups will be placed together, but at multiple tables if your party is greater than four. Parties consisting of less than four people will be seated with other parties, until there are four people at your table. So far this is a limited run event being held only on select Friday and Saturday nights. Some nights host two seatings for the event. 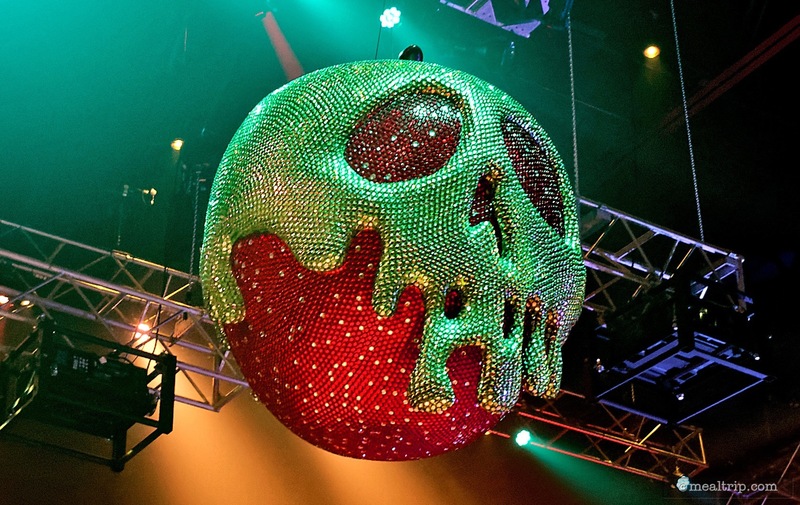 Tickets to Club Villain are $129 per person, (tax and gratuity included), however, we've seen annual passholder promotions from time to time at $99 per person. Reservations are recommended and can be made up to 90 days in advance, either by booking online (click here) or by calling (407) 939-3463. 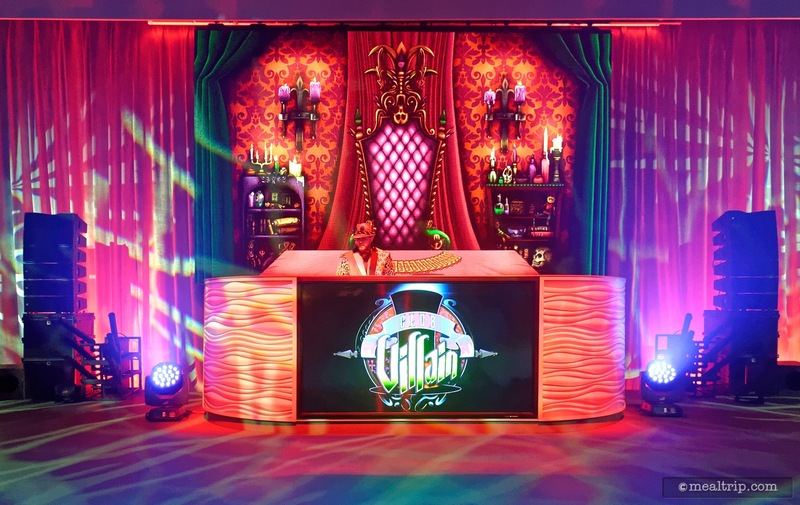 While the reservations for Hollywood Studio's Club Villain event were made through the dining reservations system, it really wouldn't do the event justice to call it "just" a dining event. Combining equal parts spooky environment and character meet-and-greets, entertainment on par with any of the larger live-action shows at the parks (on a smaller scale), along with food and cleverly themed beverages, this was one of the most equally balanced, well rounded extra-cost ticketed events that I have been to… in a very long time. The key to any successful event is the element of surprise and so I don't want to completely dissect Club Villain, and at the same time, I don't actually have many tips, pointers, suggestions, or dings… to write about. If you're going… have fun!!! If you want to stop right here and just look at the photos… I won't hold it against you! To a certain extent, this page and the photos are for the 900 people that have yet to attend Club Villain, as the event has been sold out for quite some time. There's always a chance that someone will cancel, or additional dates and times could be added, so it's definitely worth checking back with the Disney reservation system from time to time, if you really, really want to attend. Heck, I'd really, really like to go again! All throughout the night, I got the feeling that every element was well thought out, and being executed at a very high level. The new Sunset Showcase building itself is going to be a blast. It seems almost purposely built to host this kind of event and so I can't wait to see what the future holds in store for the space. 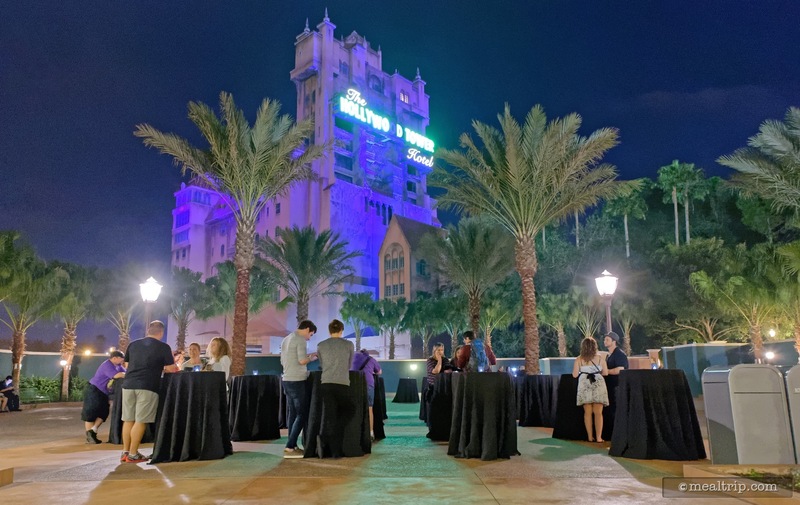 There is an outdoor reception area, (after you check in for the event of course), located in the shadows of The Hollywood Tower Hotel and it offers a bit of bench style seating around the parameter, along with quite a few standing tables. I only mention the reception area because much to my surprise, bottled water, and/or a glass flute of sparkling wine (probably Prosecco) were offered to guests while waiting for the event to start. Each party is given a printed card which contains your assigned table number, a brief prolog to the event itself, an autograph from each of the four villains, and a menu of the savory items and culinary stations that will be available. Once inside, you'll find a DJ playing some villainous tunes, and ample staff on-hand to help you find your table number. 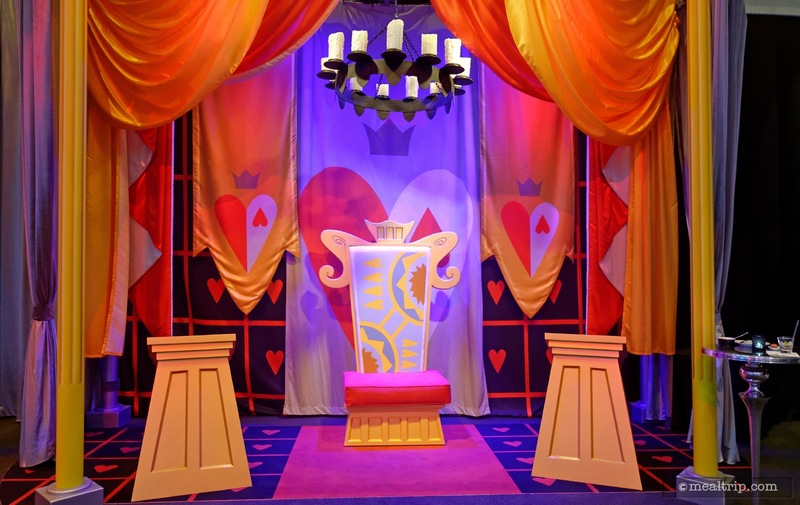 The two-hour Club Villain event does feature banquet-style seating… basically there's a bunch of little round tables with four chairs at each table. If your party has fewer than four people in it, you will have a guest or guests joining you at your little round table. The biggest issue with this type of seating only seems to arise when guests don't realize this... at any time prior to the event. It's well-written on the event write-up, and I'm sure reservationists would tell guests this in their little spiel when booking the event on the phone, so it really shouldn't come as a surprise… and yet it does occasionally. As a solo diner, there's nothing worse than having three people come over to your table and wonder who the heck you are, and why your sitting at their table… when they haven't been fully introduced to the concept. It's the "Goldilocks shock", and while it usually works out okay once you start talking, sometimes it doesn't… and that's really too bad. The square event space is set up like a club. Not a modern-day club… more like a high-end speakeasy club from the 1940's, where the center area is left open for performances, tables for the guests outline the main area on three sides with the bars and culinary stations behind the tables, and the character meet-and-greet areas behind those. While it did feel a little tight in the "table" area, it's actually not the smallest space that some of these events have been held in. So relatively speaking, for a Disney event, the cramp-ness levels were what I would call moderate. After you got up and started walking around the "club" though… it didn't feel crowded at all really. 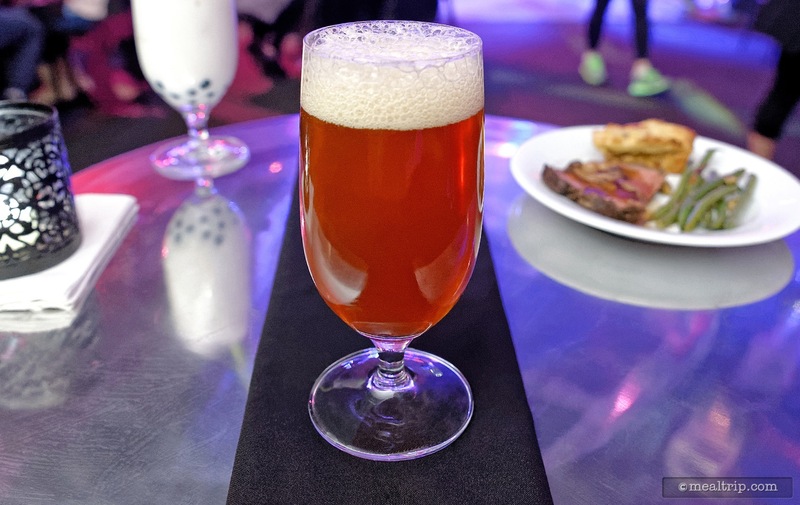 There wasn't that "line of 150 people waiting to get drinks" that you sometimes find at the bar or at the culinary stations at these events… everything was well spread out, and there were more things to "do", than just eat. I think that may be the key reason this event felt like so much more than what it was… it's "your" time in the club, it's "your" space… do what "you" want over the next two hours. Sure, we're going to put on a show… watch it, don't watch it, eat, drink, meet with characters, do what "you" want. A few other special ticketed Disney events, (which will remain nameless), are more structured and a little shorter, to the point where you never really get a chance to decompress and enjoy the moment. Here's the fireworks, eat a cupcake, now get out. There was enough time and space at Club Villain to live the moment at your own pace, (as long as you don't stay all grumpy about the seating… yes… I may in fact be directly talking to my tablemates at this point, but I digress). On the back of the card that you were handed when you checked into the event, there were two sets of times, with two villains names above each time. 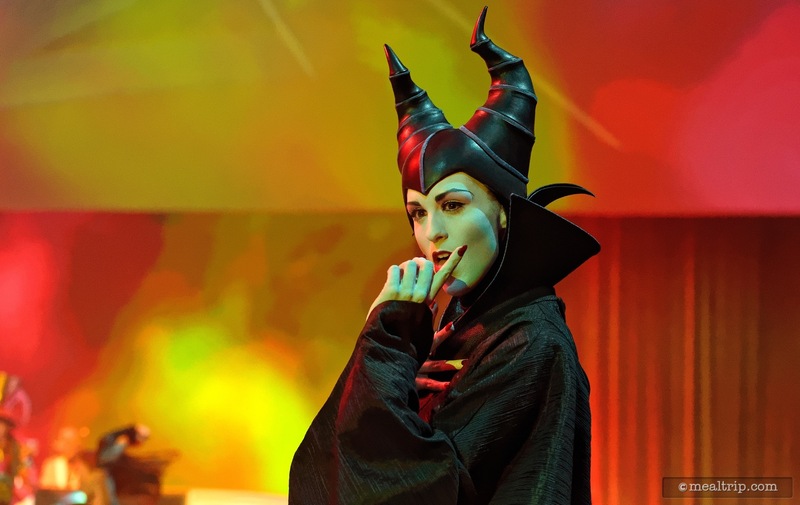 This was to suggest what time it would be best for you to visit the meet-and-greet villain stations to visit with the (sometimes hard to find) face characters (i.e. no masks or fur… real people in costume), chat it up a bit, and have a photo or two taken with the villains. Since the cards were custom printed, each table had it's own time, and this kept the lines at the meet-and-greets to a minimum… very clever. There are two villains on each side of the room, so the time corresponds more to the side of the room you're supposed to go to, more than the actual villain. You could meet with both of the villains on your side of the room at your specific time. If you miss your printed time completely, no worries... there seems to be a bit of a pad built into the end of the night where there are no tables scheduled (or so it would seem), and so everyone should get a chance to meet each of the four villains before the night is over. Disney PhotoPass photographers are on-hand to take your picture with their camera, or yours, at each of the stations. The costumes, the characters, and the backdrops here are all top-notch and truly, beyond what I was expecting. Maleficent, the Evil Queen (from Snow White), Cruella De Vil, and the Queen of Hearts (unless I'm mistaken, this is the first time that the Queen of Hearts has been portrayed as a "face character" i.e. 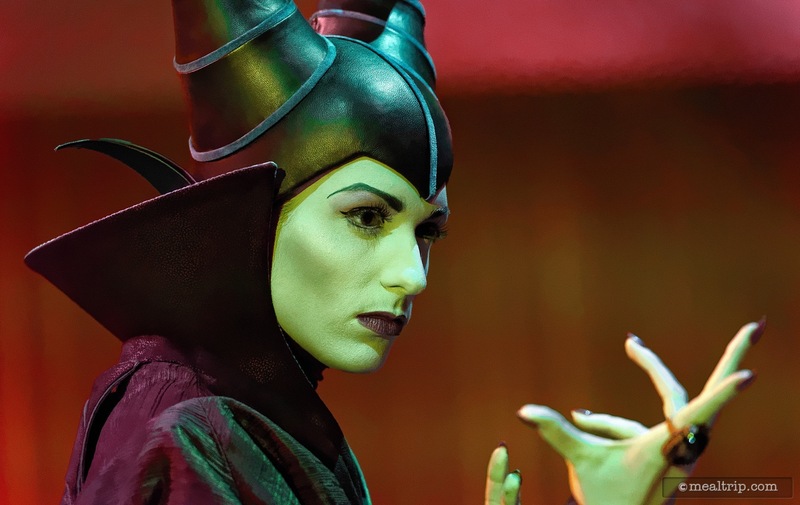 without a mask, an actual women under the makeup)… are all on hand. Those four villains are also "in" the show so they are not "always" available at the meet and greet areas. Dr. Facilier occasionally worked the room, but he was more of a stage presence than a character that you could meet… a lucky few managed to snag a photo with him every now and then. Disney actors and actresses do a great job of portraying those face characters, and that was certainly the case here… totally in character, amazing costumes, totally fun to interact with. The real surprise here was just how much attention was paid to the sets they were in. These were so much more than the vinyl backdrops that you still occasionally find here and there. 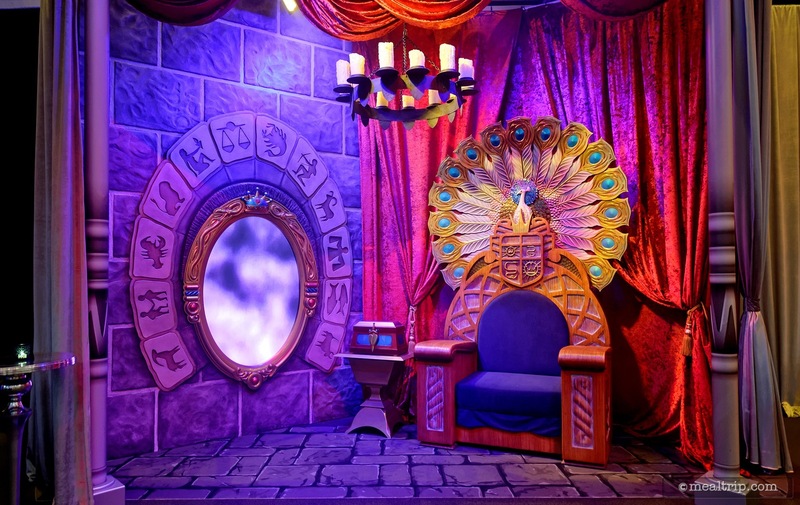 The Evil Queen had a gorgeous throne, a jewel studded poison apple and an real-live mirror-mirror on the wall, complete with a face that would pop in to talk to her every once in a while. 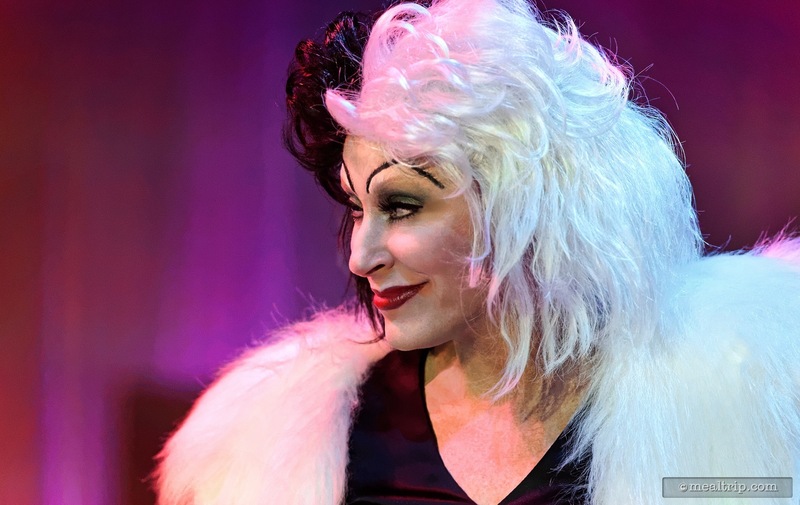 Cruella De Vil had a purple couch to sit on, an old rotary phone that looked like they came right from the cartoon, and even few small dalmatians under her chair (okay, they were plastic but really... you don't want live dalmatians, the plastic ones are much easier to clean up after). 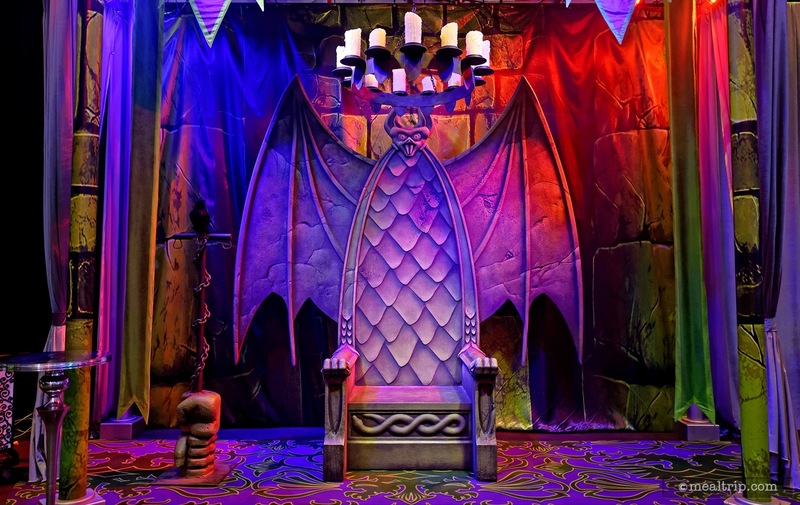 Maleficent not only had a giant stone-looking bat throne... but a giant stone-looking bat throne that had smoke pouring out of it's arms! I mean really… for an event that only had eight night/shows… this is the kind of over-the-top detail that can make these Disney Park events world-class. Another element that I wasn't really expecting was the "show" that took place in four or five, well-paced and timed intervals between the DJ's music. Many of the "show" elements took place in the center floor area so that everyone had a great view, no matter where their table was. This is really what made it feel more like a performance club of yesteryear. There's no ropes or lines to cross, you could be walking from one side of the room to the other, when all of a sudden there's a few Broadway-class performers gently shushing you out of "their" space, in order to perform. It's this kind of in-your-face performance that made groups like the Hollywood Hitmen so memorable… they're right there, you can make eye contact with them, you could reach out and touch them, but dare not to. Those kind of performances are memorable, and I hope we continue to see this format, in this building, for years to come. While Dr. Facilier was technically the main "host" of Club Villain, the emcee of the night "Kanzo" was the real star here. Man, can this kid sing. I'm not going to get too deep into each of the performance segments, but I will say this… even though each singing or speaking performer has their own wireless headset microphone, there was a number at the end of the night where you could hear Kanzo belting out notes… and they were coming from him… not the speakers. It made me stop what I was doing and pay attention a bit more… so kudos to you Kanzo, whomever you are. Some performance segments were to introduce the villains, some were general song and dance type numbers (at one point, poor Kanzo had to pull two dancers across the floor using a giant silk scarf), and one was even to introduce dessert! The event space never got so dark that you couldn't still move around and visit the culinary or beverage stations, if you chose not to watch the show. But really, even if you're not a song-and-dance kind of person, take a second and just watch one or two of the segments… these performers probably spent more time in rehearsal, than they will be "on-stage"… a lot of planning and effort has gone into the entertainment. 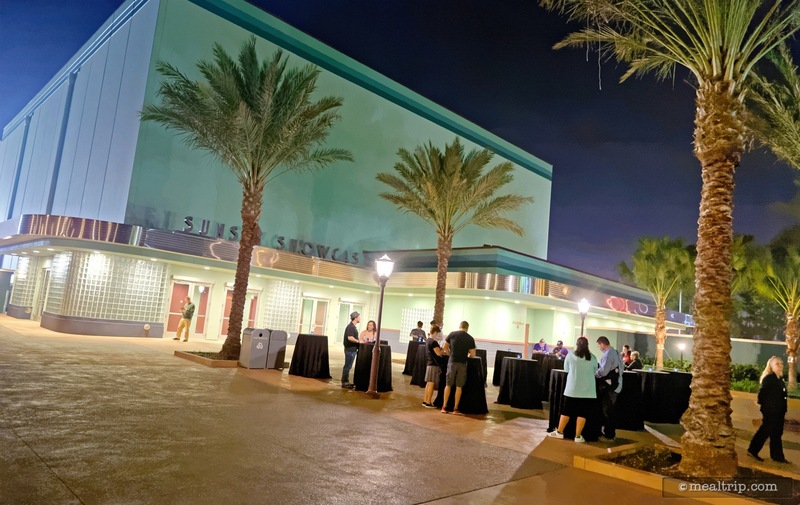 As is the case with many of the dessert party or dinner receptions that are part of Disney special events, the food and beverages are all you care to enjoy, for no additional cost. 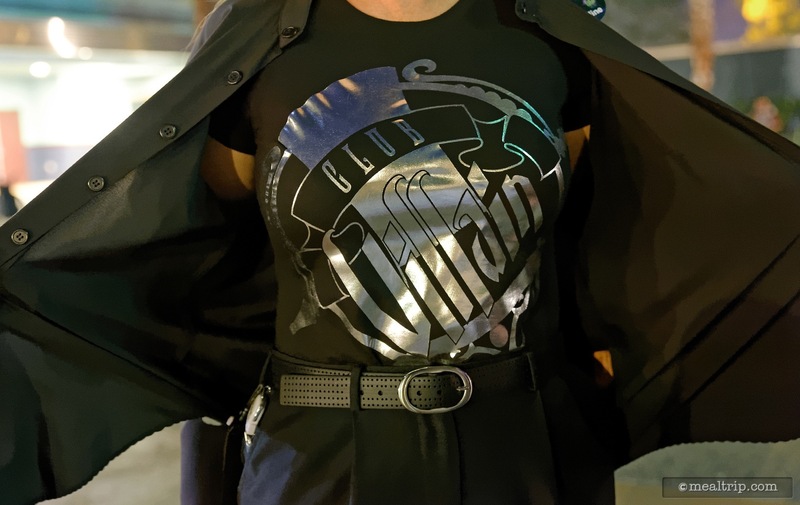 Once you're in Club Villain, you're "in" the club! While both of the bars had a couple of wine, beer and soda selections, the unique well-themed cocktails are what everyone wants to try. Served in real, actual "glass", there is one cocktail themed beverage for each of the four villains, the left and right bars had two different cocktails. Each beverage had three or four parts to it, and were mixed "to order". Beso del Sol Sangria, Peach Schnapps, and Pineapple Juice. 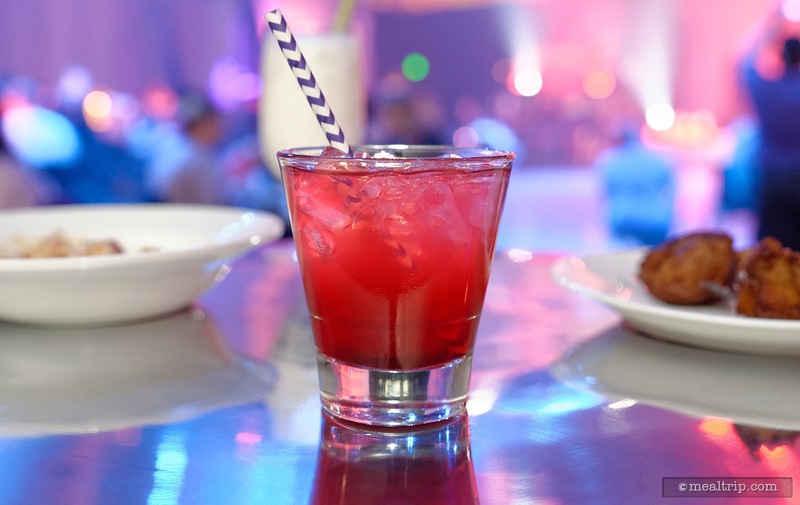 … now, you may not like each one because most people have a cocktail profile that they stick pretty close to, but as a foodie, I can really appreciate each beverage. The look and flavors do seem to have some connection to each villain, and I throughly enjoyed trying each one. The food at Club Villain is all solid American Standard fare. Now, if you read my reviews, you've been seeing the phrase "American Standard" more and more. This is not a ding on the event or any restaurant. It's just that (increasingly) when you're at a Disney-based location and read "New Orleans Cuisine", you have to understand going into it… that these are all, at their core, high-volume eateries and/or event-style food service. Quite a few people have to be fed in a very short time, without a ton of customization. As such, most of the food is not as "authentic" as the marketing copy might lead you to believe it is. I think as long as you go in with the idea that "New Orleans Cuisine" in this case means that the salad will have green and purple things in it (get it, the "colors" of Mardi Gras), the Spicy Andouille Sausage is going to be quite a bit more like a ground beef meat ball than you might expect, and the Chilled Haricot Verts with Muffuletta Vinaigrette is going to be green beans with bits of tomato and ham tossed in… you'll be in a better mindset than you would be if you were expecting to get truly authentic New Orleans dishes. Again, that's not a bad thing, but "safe and solid" are two words that I might use to describe the savory dishes. The Dirty Rice and Cajun Chicken Gumbo, Sticky Pig Wings with Citrus Gremolata, and the Corn Polenta with Sautéed Shrimp were among my favorites. Check out some of our photos for more savory item descriptions. 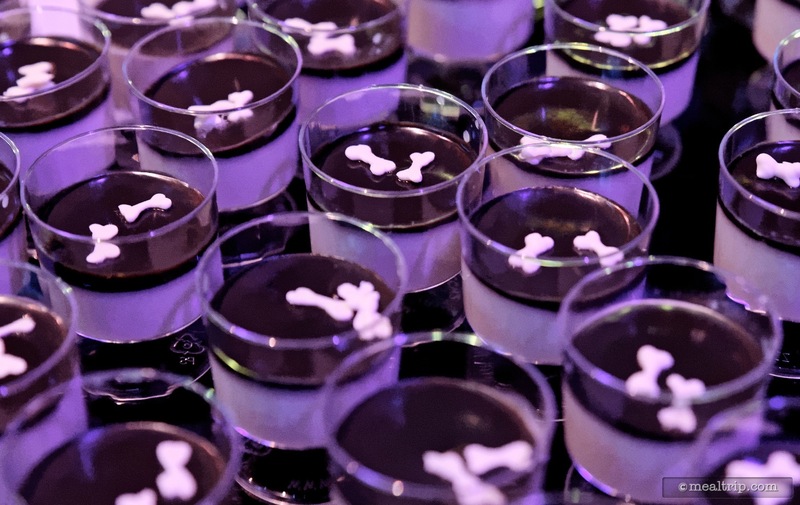 … standouts for me included the Red Wine Cheesecake Pushups, the Red Macarons, and both of the Evil Queen's desserts, the Green Apple Mousse and Truffles with Apple Stem on Spoons were two items that I have not seen at other dessert parties. Toward the end of the evening (in what should probably be considered a "last call" of sorts), Kanzo (the Club Manager) and Dr. Facilier instruct the chefs to bring out Creme Brûlée for everyone! If you've ever been to a special ticketed dining event, (for example, at the Epcot Food and Wine Festival), you probably already know the entire cast, from event and banquet staff to the chefs and beverage personnel and anyone in entertainment that you might run into... are the very best large group event people available in Central Florida. You really do get the sense that they enjoy working the events, as much as you enjoy going. Once again, I credit them all for hosting and successfully executing another fabulous event. Make no mistake, if you have Club Villain booked, consider yourself lucky… this is a top-notch event. It's not the cheapest way to eat dinner at Hollywood Studios of course... but it's been a long, long time since I've seen so much in the way of show elements, entertainment, unique and rare meet-and-greet opportunities, food, beverage, and dessert offerings… all for the $99 per adult that is being charged. I hesitate to write that it's a great value, (relatively speaking), because usually right after I write such things, they seem to raise the prices. I don't know if they are going to offer more dates or times after this first, initial run. My guess is… probably not immediately... but possibly after a small break where they can evaluate how all guests felt about the event. As I wrote in the top of this review, I can't wait to see what the future holds for this great new event space… and it's entirely possible that the next event, (which may or may not be similar to this one)… is probably already in the works. Only time will tell for sure, but if you have been one of the lucky 1,000 to have booked this inaugural Club Villain event… good for you! 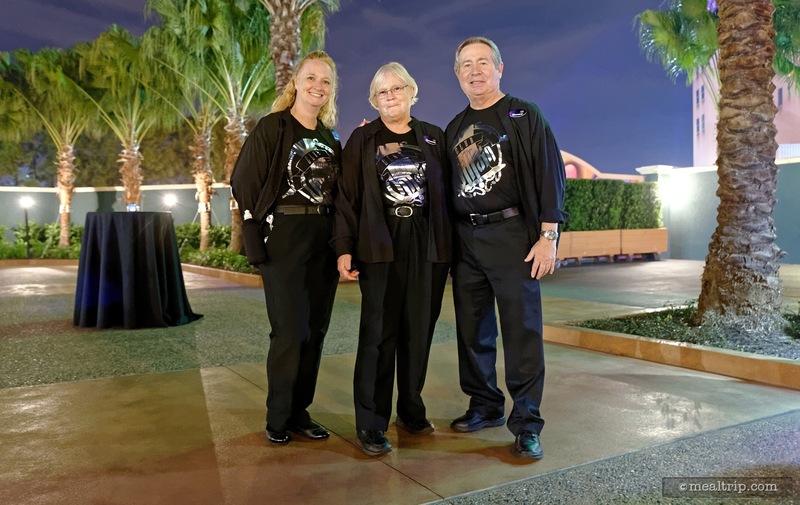 If you were expecting authentic New Orleans style cuisine or, if you absolutely do not like the idea of sitting with other park guests (and only if your party contains less than three people)… than you might not feel the same way about the event. If you already have a reservation and are thinking about canceling it because of something you've read here… could you let me know first? I'd really like to grab your spot as soon as it hits the open reservation system again! CLICK HERE to view all 69 images in our photo gallery.